I had every intention of writing this blog post about the new show at Willow Street Gallery while I was on vacation last week. Every intention! But then, I got to our beach house rental… and there were rocking chairs on a front screened-in porch (give me a good book and this is my kryptonite). And the sounds of the ocean lulled me into a beachy stupor. So that was that. No work was done. But now I am back on it! One evening last month, I grabbed my hubby and we headed out towards the Takoma area of Washington, DC. I wanted to check out the opening reception for We Met on Instagram, a group exhibition at Willow Street Gallery featuring the work of 14 artists from the East Coast Art Collective. First of all, the title is on point! What did we do before Instagram? It seems like every night, I tell my husband, “I discovered this amazing artist on Instagram today. I have got to show you his/her work!” It has fundamentally changed the way artists can connect with other artists, as well as with collectors, advisors, and galleries. Furthermore, living in my little corner of Maryland, I would never have known about Willow Street Gallery without having come across it on Instagram. It’s an intimate gallery space tucked away in the heart of a vibrant DC urban/suburban neighborhood. The gallery is a part of a members-run arts organization called DC Arts Studios, which provides studio space for local artists and fosters collaboration and support within the creative community. What Happens When Artists Meet on Instagram and Come Together in Real Life? The central theme of this exhibition: What happens when artists meet on Instagram and come together in real life? I learned that many of these artists discovered one another through #aCreativeDC on Instagram. This hashtag is how I discovered many of them as well. I love seeing the photographs of works in progress, detail shots of much larger pieces, and artists’ studios (where the magic happens). Moreover, I love the photographs showing the behind-the-scenes process and when artists share what drives and inspires them to create. There is, however, still something special about making a face-to-face connection. There is a nuance of personality that can only be discerned by real-life conversation. And that is why I love going to gallery openings. The chance to meet the artists in person or to hear them speak about their artwork. Does knowing the artist affect how we experience the work? I think so. For me, it provides meaningful context that makes the viewing experience even richer. At the opening, after taking in several of the paintings on display, I made my first introduction to Stefanie Stark, a local artist who I (appropriately) came across on Instagram. She shared a really inspiring story on the social media platform about how she came to fulfill her calling as an artist later in life. Many of her pieces showcase these beautiful deconstructed florals that blur the line between abstract composition and botanical still-life. They often include long drips of thin paint over areas of softly blended color that give the impression of viewing florals submerged in water or perhaps, delicately floating at the surface. In addition to her artwork, I loved that Stark is a fellow Bethesda, MD area resident. While her work was not a part of this exhibition, it was lovely happenstance that we both attended the opening at Willow Street Gallery and were able to meet in person. It really was the objective of the exhibition come to life: bringing people together in person for inspiration, encouragement, and creative collaboration. This Washington, DC-based artist uses GLITTER (lots and lots of glitter) and adhesive on wood panels to make these shimmery, eye-catching works of art. I first saw her pieces displayed at Blind Whino, an amazing art facility located in the historic Friendship Baptist Church in Southwest DC. Find her on Instagram @jordannwine. This Arlington, VA artist uses a palette knife (not brushes!) to apply paint in thick layers and create interesting and varied textures. A fun fact that I learned from speaking with Ann at the opening is that she works with oil paints (rather than exclusively with quick drying acrylics). The overall effect is reminiscent of looking at a deliciously frosted cake. Find her on Instagram @annmariecoolick. Another DC area artist, Olmstead applies washes of translucent color that are accented by shimmering touches of gold leaf. Soft, peaceful, and heavenly… these are the words that came to my mind when standing before her work. Find her on Instagram @christineolmstead. This artist is based out of Philadelphia and New York City. I was staring at her painting thinking how the application of paint creates this beautiful basket weave effect. It draws you in and invites you to take a closer look: How is the paint applied? How many colors are captured with each stroke of the brush? And when you stand back, I love how this careful placement of color directs your eye and creates subtle motion and flow. Find her on Instagram @ingridandching. One of my favorite pieces from the show… minimal in form with a deadpan delivery that dares you not to laugh. I couldn’t help but think that Andy Warhol, Ed Ruscha, and John Baldessari (some of my favorite artists from the modern era) would approve. Find her on Instagram @kaseyoboyle. It’s not every day that you get to see mixed media paintings completed on circular canvases. This Washington, DC artist displayed two works in this round format, using acrylic paint, gold paint, resin and opaque glitter. These paintings have a beautiful sense of depth to them and have a still-wet quality… like looking into perfectly round pools of poured paint (wow…say that three times fast!). Find her on Instagram @loryiveyart. The work of this DC area artist uses bright pops of color and graphic lettering and symbols to create works that look like deconstructed signage. Check out Pekala’s Instagram (@marcsart) to see the amazing exterior mural project that he just completed on the sides of a shipping container for the Fab Lab at NoMa in Northeast DC. If we haven’t done so already, I’d love to meet you on Instagram! Follow me @laurenhellerartconsultant. I am a wife, mother, and lover of art! 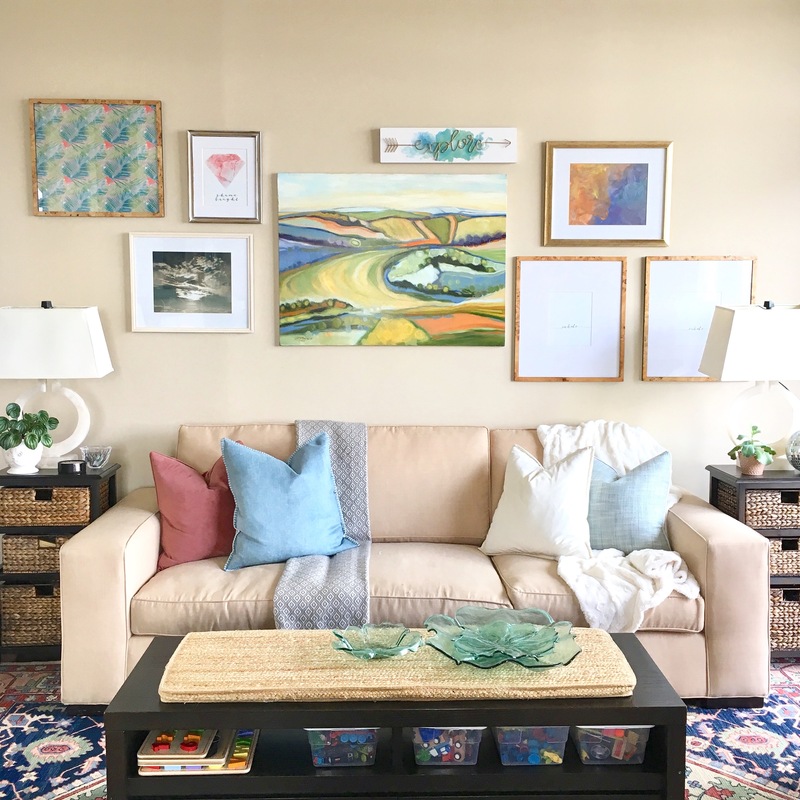 I started Lauren Heller Art Consultant in 2017 to bring professional art services to the DMV area. I am passionate about art and design and believe that there are art solutions for every budget. This is Art Consulting for the Real World! Interested in any of the paintings highlighted above? Send me an e-mail and I will take care of contacting Willow Street Gallery, as well as handle delivery and installation of your new piece.